Section 80E: Tax Deduction for Interest on Education Loan! 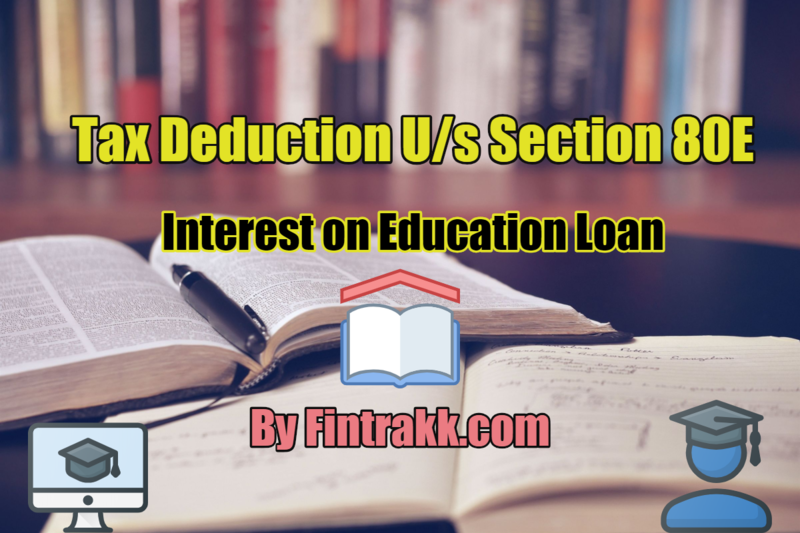 Through this blog we shall be highlighting a very important deduction: Tax deduction Under Section 80E of The Income Tax Act related to Interest on Education loan. Education is quite an expensive affair these days, especially if one has to pursue higher education in India or abroad. We have to shed loads of money from our pockets for getting good high education from reputed Institutions. This is when Education loans come to our rescue. When you avail a loan facility, you have to repay it back, that too with interest added upon. Now, this paying in the form of interest on your Education loan also creates an extra burden on the common man. But,are you aware that you can save some of your taxes if you have availed an education loan. Simply stated, you can claim Tax benefit if you have taken an education loan.This helps in reducing the overall cost of the education loan you have taken. Now, what kind of tax benefit it is, you will come to know as you read further…. So, here we shall be discussing all about Section 80E. Who is eligible to claim this deduction under section 80E? What is covered in the ambit of higher education? How you can claim this deduction under Section 80E? What is the quantum of deduction that you can claim? When can you claim this tax benefit U/s 80E? What are the conditions for availing this deduction? If you have taken an education loan, you are eligible to claim this tax deduction. ALSO READ What is GST or Goods and Services Tax in India - An Overview ! But, wait its not that simple…there are certain conditions to be fulfilled before claiming this deduction for interest on education loan. Deduction under Section 80E can be availed by Individuals only. So, HUF, firm, Company or any other assessee is not allowed to claim this benefit. You can claim this deduction for the interest paid on education loan only. So, this means that interest you pay towards clearing educational loan qualifies for this deduction. Please note that you cannot claim deduction for the principal component i.e. any principal amount repaid is not covered here. Section 80E deduction can be availed for education loan taken by an Individual himself or for his/her spouse or children’s education. You can also avail this tax benefit for education loan taken for a student for whom you are the legal guardian. Hence, parents are eligible to claim deduction for interest paid on their children’s higher education loan. Looking at the increasing cost of education, such a big sigh of relief it is…isn’t it! Just remember, Loan should be in the name of Individual, who is claiming the deduction. You should have taken the loan from a recognised Financial Institution or approved charitable organisations only. You cannot claim this education loan deduction against loan taken from relatives or friends or any other entities except the ones stated above. e.g. If you get a loan from your friend, even if you repay him any interest alongwith principal, the same shall not qualify for Section 80E. You can avail this tax benefit, once you start repaying your education loan. So, when you actually pay the interest, you qualify for this deduction. The interest should have been paid in the previous year from income chargeable to tax. You should have taken loan for pursuing higher education. “Higher Education” for this purpose refers to any course that you pursue after completing your Senior Secondary Examination or its equivalent. You can avail the benefit of Section 80E for Vocational courses also. This section extend its benefit for education loan taken for studying abroad as well. An important point to keep in mind is, this deduction is over and above the Income tax deduction Under Section 80C. Section 80E deduction can be availed only for a maximum period of 8 years. This means, you are allowed to avail this benefit in 8 years or until the interest is paid in full (whichever is earlier). So, individual can avail this benefit in the year when he starts paying the interest plus 7 succeeding years. Hence, it is always prudent to wrap up your loan in 8 years and also claim the maximum interest deduction over the years. There is no upper limit for availing the deduction under Section 80E. So, you are allowed to claim the entire interest amount. You just have to keep in mind that only the interest component is considered and maximum period to avail is 8 years only. ALSO READ Form 16 for Income tax return filing: Meaning, Format & Details! These are the conditions to check eligibility for availing interest on education loan deduction. If you are inquisitive about home loans as well, do check one of our popular posts: 7 Home Loan Facts, tax benefit on Home loan: A complete guide! And, yes…Don’t forget to provide these details to your employer so as to avoid any excess Tax deduction at source or TDS from your salary. So, you have taken an education loan for yourself or your spouse or your children and find yourself eligible. If yes, go ahead and save some of your tax by availing this deduction under section 80E. Feel free to share your valuable feedback or any related queries in the comment section below. « Leave Travel Allowance : Know Rules,Tax exemption of LTA !